This post is not really a travel post for us, but more like sharing some of our favorite destinations in our own neighborhood— Chelsea in downtown New York City. 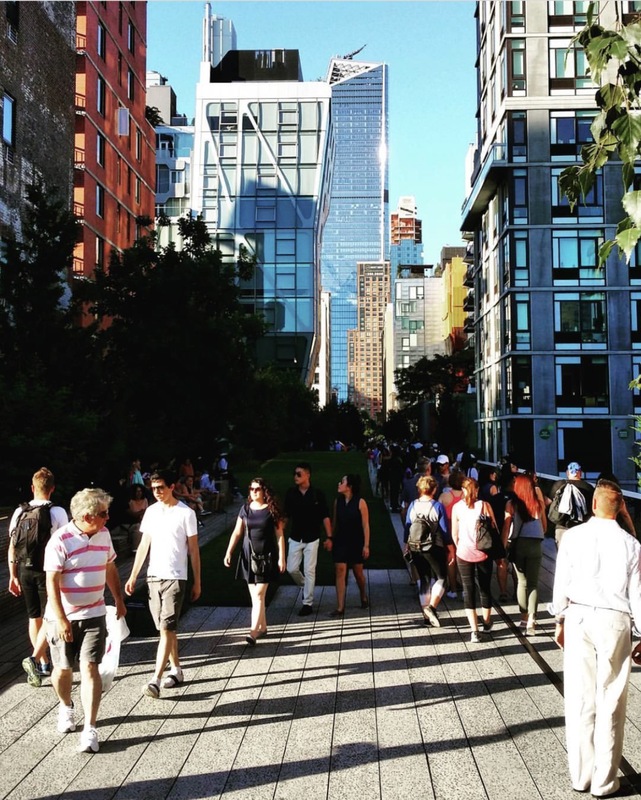 When we have visitors, we only have to walk a few blocks west to enjoy wonderful food, shopping, the High Line, the Whitney Museum, and more. We often gauge our walk by how hungry our friends are. 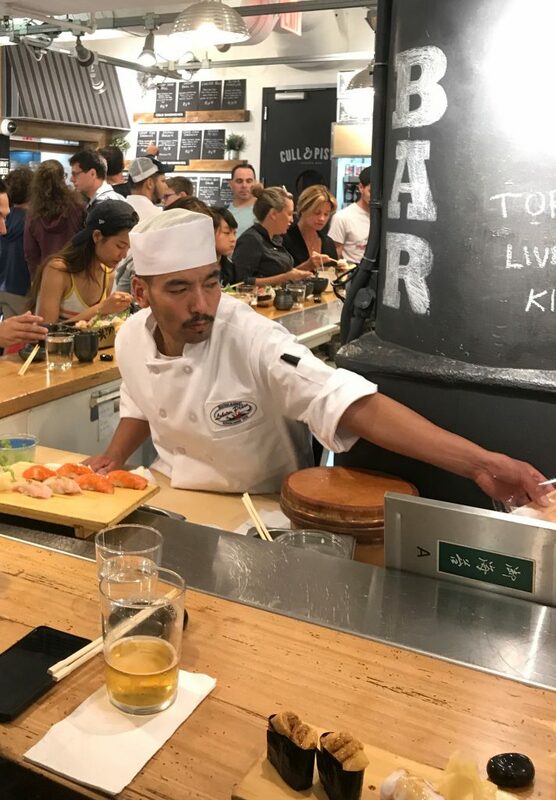 On a leisurely summer afternoon, we might start with a nibble at Chelsea Market, then head down to the Whitney Museum to see the current exhibition. 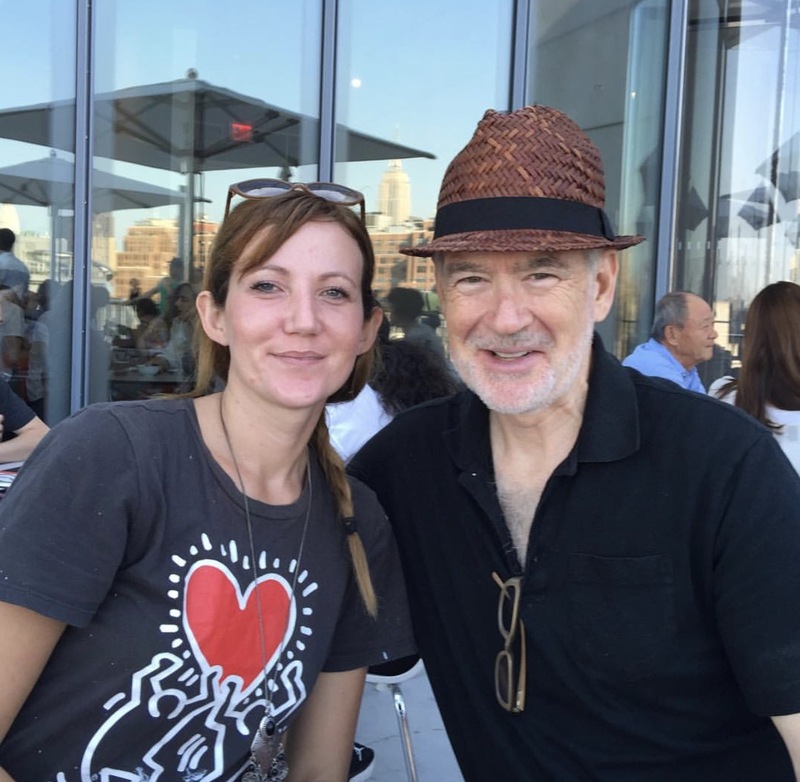 We often stop for a glass of wine at the Studio Cafe, the Whitney’s restaurant on the roof. We love their outdoor deck, offering light, tasty fare and a panoramic view of the downtown skyline. If our visit extends into the evening hours, we usually head over to La Sirena, our favorite restaurant for dining outdoors on the beautiful upper terrace of the Maritime Hotel. 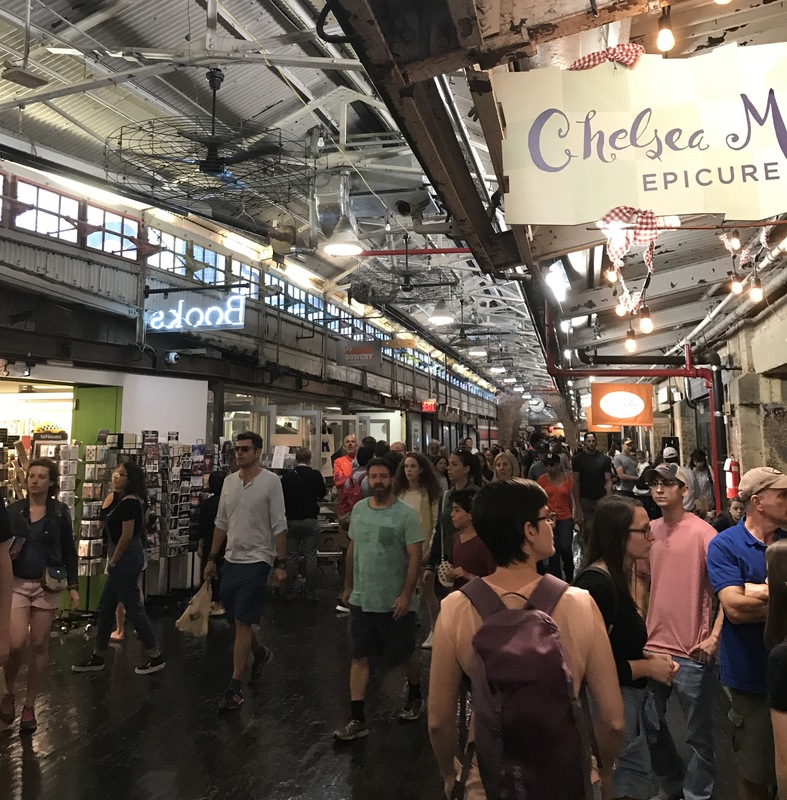 Each day more than 25,000 people— tourists, foodies, and New Yorkers —stroll through Chelsea Market. 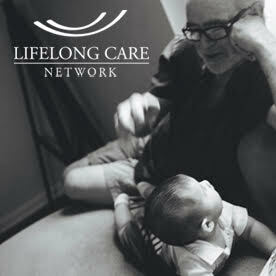 In high traffic times, the total number can be more in the range of 40,000 visitors each day! If we are passing through with friends who are hungry, we might grab a taco at Los Tacos or some gelato at L’Arte del Gelato. There are plenty of affordable options for a quick and delicious snack, as well as a tremendous selection of restaurants for seated dining. The challenge at Chelsea Market isn’t finding great food, it’s to find a place to sit down and eat it, which is why you might want to order your eats to go and walk over to the High Line. The 16th Street entrance of the High Line is just across the street from Chelsea Market. The High Line is a wonderful urban park that thousands of tourists and New Yorkers enjoy every day. Major supporters like Diane von Furstenburg, Barry Diller, and many other Friends of the High Line gave the money to transform an elevated train railway unused since the early 20th-century into an ideal 21st-century park for strolling in a beautifully landscaped park setting. The High Line overlooks the Hudson River, the West Side piers, and the Meat Market. You can see the Statue of Liberty in the distance and across the river to Hoboken, New Jersey. The garden landscaping and foliage changes with the seasons, making it popular all year round. In warm weather, people are perched on the built-in seating watching the children playing barefoot in the water works. We love the friendly bistro-style pub Terroir in the summer months. This outdoor bar near the 16th Street entrance has communal tables, and is a great perch for catching the sunset over the Hudson River while enjoying a glass of wine or a craft beer, and simple, satisfying bar food. Architecture buffs walk north to see stunning new statement structures by Frank Gehry, Zaha Hadid, and many more of the world’s most sought after architects. These new buildings represent some of the most expensive apartment living in the city. See the link at the end of this post to identify more of the buildings, old and new, you will encounter on a High Line walk. Most often, our destination is the Whitney Museum of American Art at the southern end of the High Line at Gansevoort Street. When I first came to New York City, I managed to land one of the coveted spots in the Whitney Independent Study Program’s museum studies internship. It introduced me to so many wonderful people who are now friends and set my course as a young person navigating my way in Manhattan. We always enjoyed the Whitney’s uptown shows in the original Marcel Breuer building (now the Metropolitan Museum’s Met Breuer). 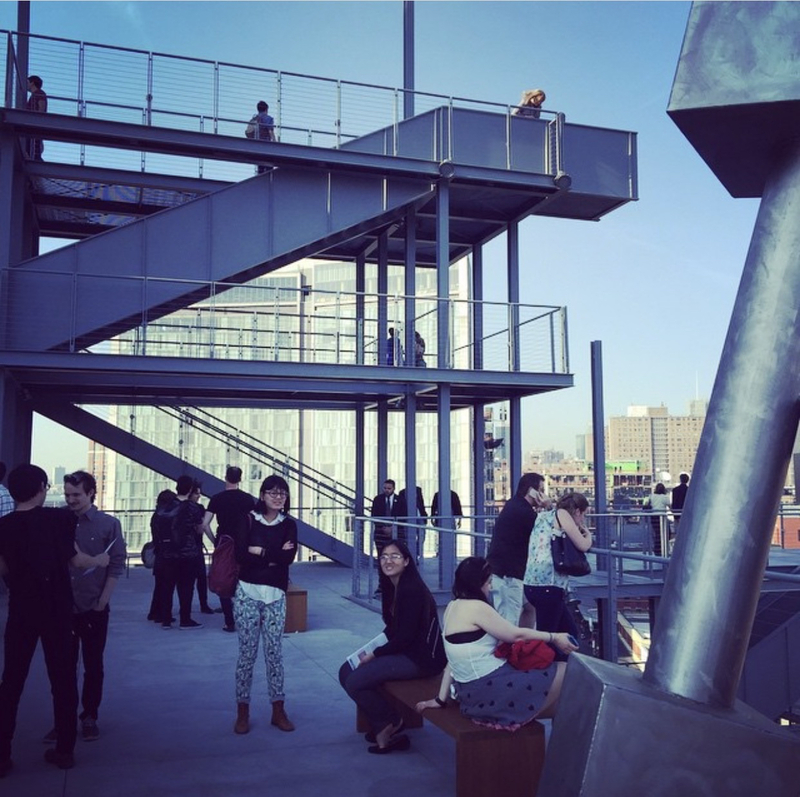 In 2016, when the Whitney opened its new downtown museum in our neighborhood, we were in heaven! Designed by Renzo Piano, it’s bigger and better, with more room for galleries, education, events, and two wonderful restaurants. From the recent Whitney Biennial to the rotating installations of the Whitney’s permanent collection, the galleries provide a satisfying and inspiring venue for viewing art. The new building has wonderful outdoor terraces, bringing views of the surrounding neighborhood in as a part of the museum experience. “There’s a generosity to the architecture, a sense of art connecting with the city and vice versa,” as Michael Kimmelman wrote in the New York Times. The scale of the museum is perfect for meeting friends, seeing one or two floors of art, stopping for refreshments, and then going back for more. The Studio Cafe rooftop restaurant will text you when you table is ready and it’s the perfect respite for some delicious light fare and conversation. During the Museum’s late hours on Fridays and Saturdays, these are coveted tables for dinner and cocktails. After going to the opening party with Jim, I went back to the Whitney Biennial four times with different friends — with each visit inspiring new perspectives on the contemporary works of art. We have also enjoyed several wonderful meals at Untitled, a really good restaurant on the ground floor of the museum. We highly recommend it for dinner. And if you only have time for a glass of wine, they have a wonderful list of wines by the glass and tempting small plates including fried fish ‘lettuce wraps’ that are simply delicious. 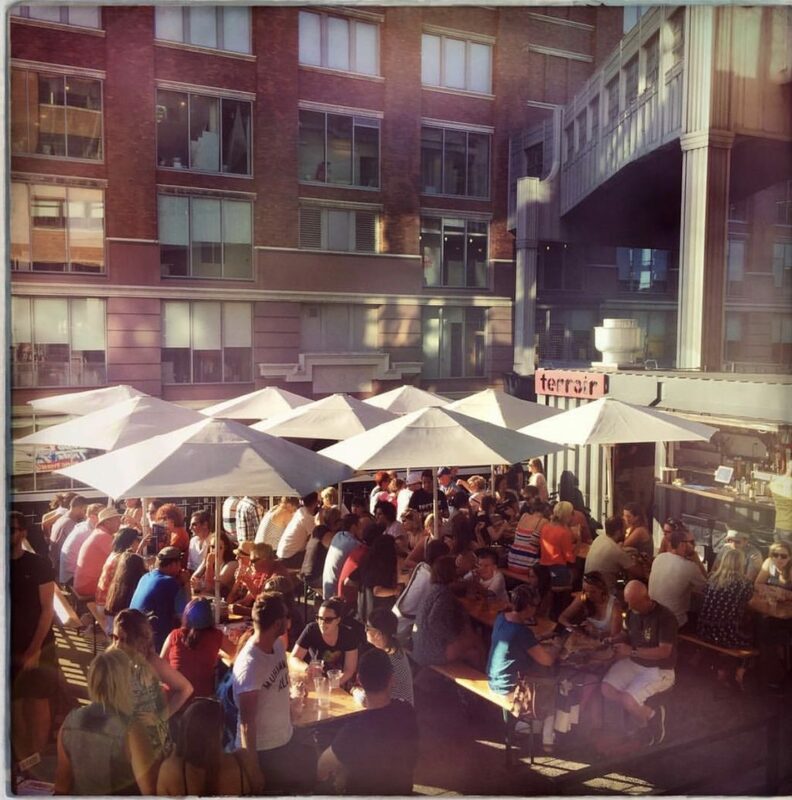 Our favorite outdoor dining spot is just across from Chelsea Market— La Sirena, on the upper deck of the Maritime Hotel. 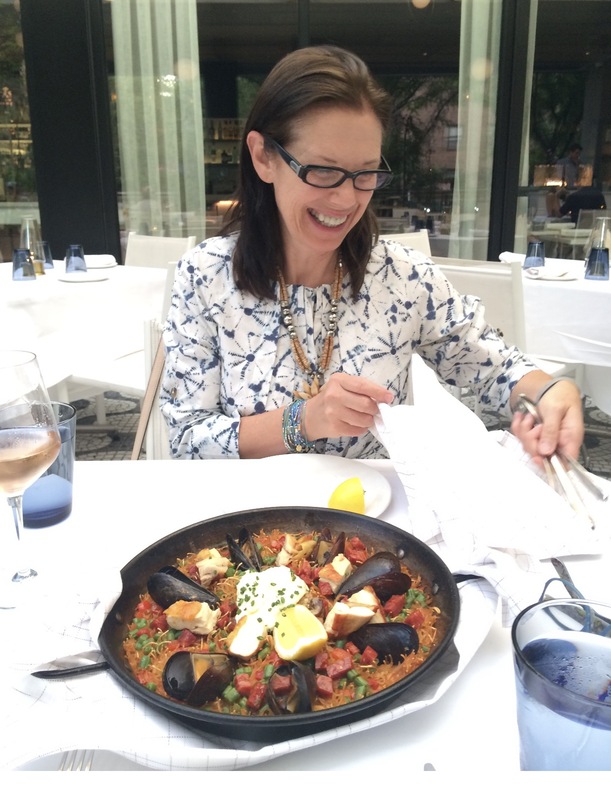 Mario Batali and Joe Bastianich have created two wonderful menus at La Sirena— an Italian menu of pastas, fish and more, and a Spanish menu of paella and small plates. Either makes for a memorable al fresco dining experience. 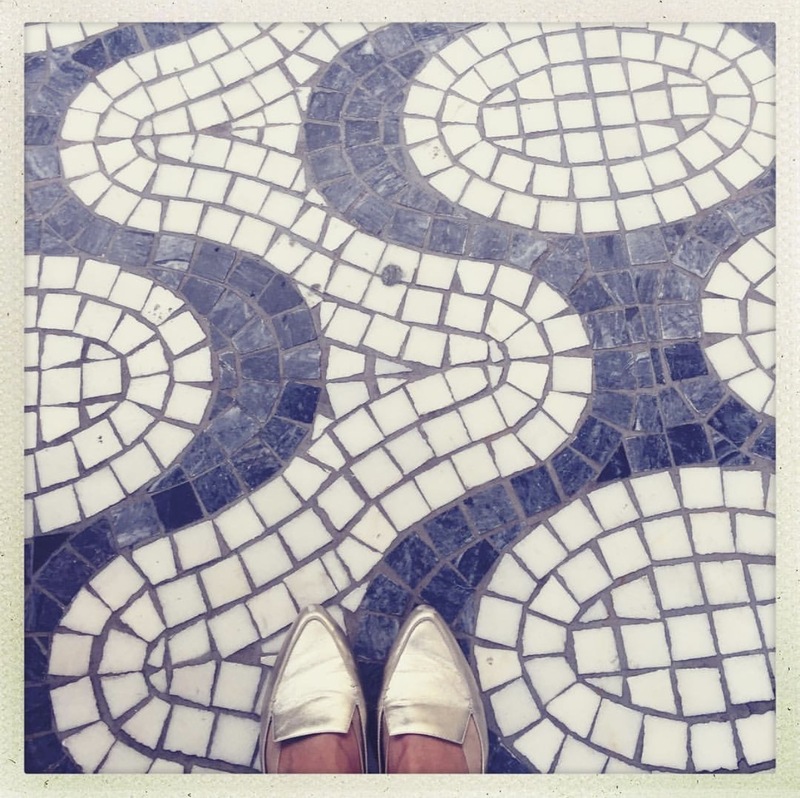 The festive black and white tile floors make us feel like we could be dining in Rio or Lisbon. In 2019, Anthony Bourdain will open a new foodie destination featuring his take on the best of food cart cuisine from around the world. Now under construction on the Chelsea Piers at 16th Street, that project will make our neighborhood even more of a food mecca. 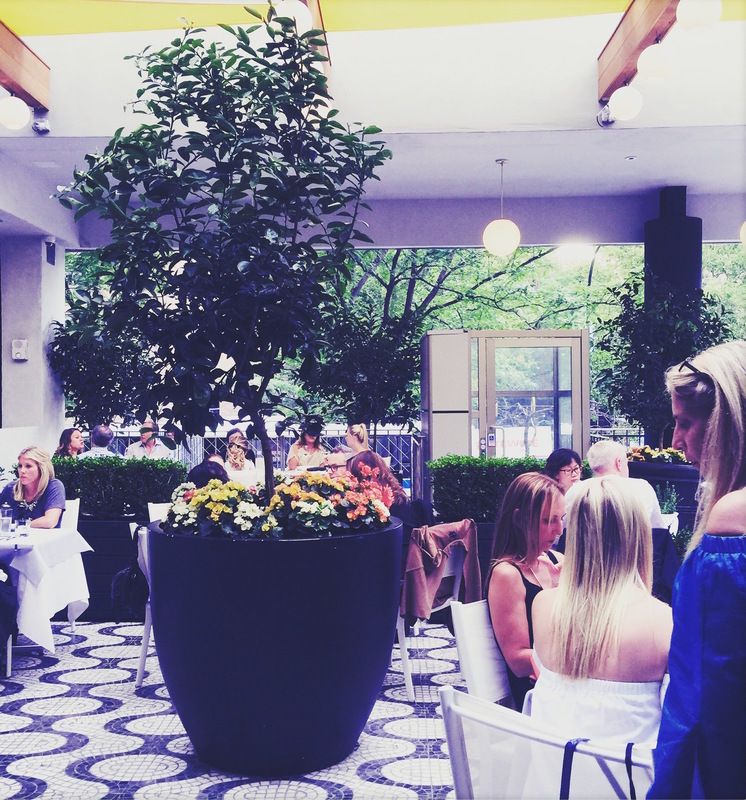 Until then, there are plenty of great options for eating in Chelsea, leisurely or on the go. Great post! It’s always nice to have a ‘staycation’ and just explore our city! You live in such a culture rich environment. The food at La Sirena looks wonderful. Thanks for these recommendations, Mary! Thank you, Sara. We’re happy to share the best of our neighborhood. We also love the Rubin Museum of Art, but that will be another post! I used to go to the Rubin a lot. They had a great Steve McCurry exhibit not so long ago. Let’s go see something one day after work!